Onyx is a beautiful natural stone that has a special quality that no other natural stone has, its translucent. 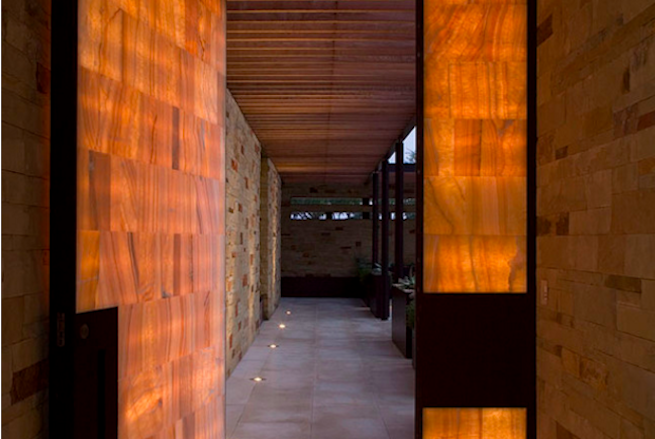 Depending on its thickness you can back light this stone and create wonderful visuals that will jazz up any installation giving you a fresh modern look. The translucency of the quartz stone, with colors ranging from white, green to red, allows the surface to seemingly take on another dimension as it glows from within. Onyx comes in a variety sizes, you can find it in full slabs, tiles and smaller mosaics. Onyx is softer then granite and other natural stones so it will need special care. Remember to quickly clean up liquids as it absorbs quickly, and be careful with acidic liquids as they can leave permanent marks no matter how quick you get to the spill. Onyx is not recommended as a counter or floor in your kitchen or bathroom because it can stain and scratch easily, although if you do want to use this stone in these rooms you may want to concider a smaller accent piece of onyx. Like any natural stone, onyx needs to be sealed and taken care of. We recommend you seal your natural stones about once a year, even if your sealer says it lasts a life time. You can also purchase cleaners that contain sealers inside them so you are adding on sealer every time you clean.